Hello Foodies of Steemit From Around The Globe! 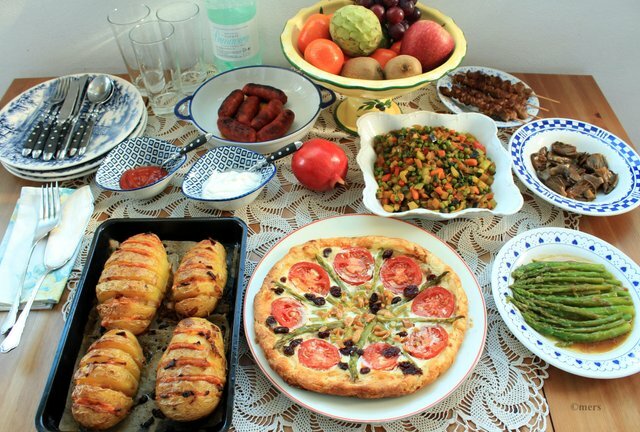 Today, I am sharing all the food I cooked yesterday just to get rid of what´s in fridge. Our days are numbered here in Andalucia as our winter holiday is going to an end next week. The fridge has to be cleared and all meat and veggies have to be cooked. I served these goodies for 3 persons and there were few remainders I have frozen so I won´t have to cook in stress before departure. So let´s see what I got here to show you. 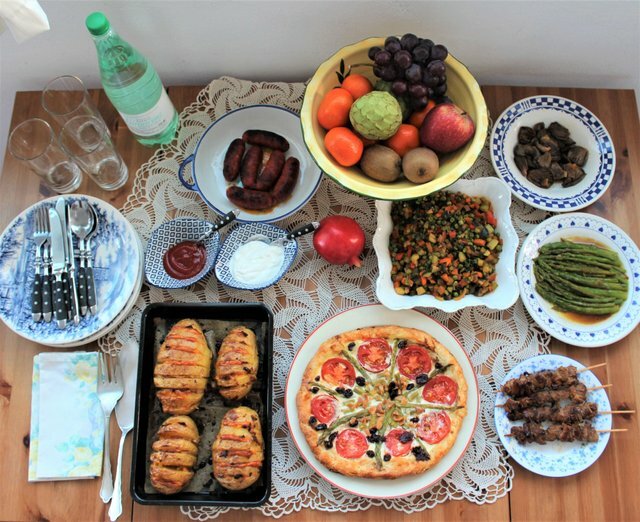 Below are the food to be munched, the meat isn´t that much but at least I have gotten rid of the veggies in the regfrigerator. 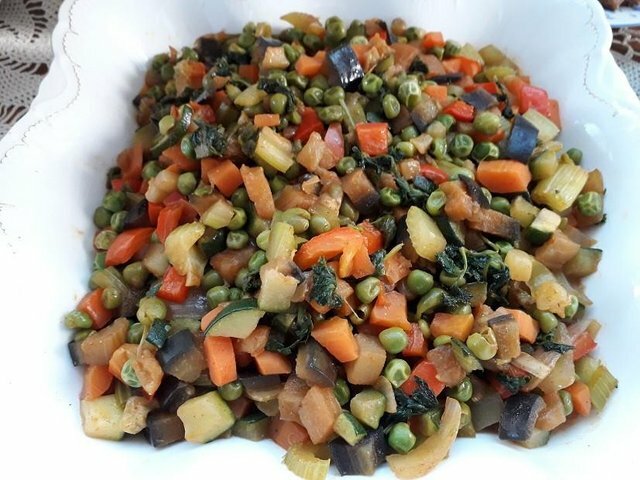 Allerlei is a general german term for a mixture normally said to food... veggies that were included in this dish were celery stalks, zucchini, aubergines, carrots, red bell pepper, onions, garlic, curled parsley and green peas, all diced or cut into cubes. I half-steemed all.... then in a pan with 3 tablespoons butter, I fried these until all are glossy in appearance. I then I added 1 cup of vegetable stock to continue cooking until a bit of the liquid evaporates. Season with salt and pepper to adjust according to your taste. 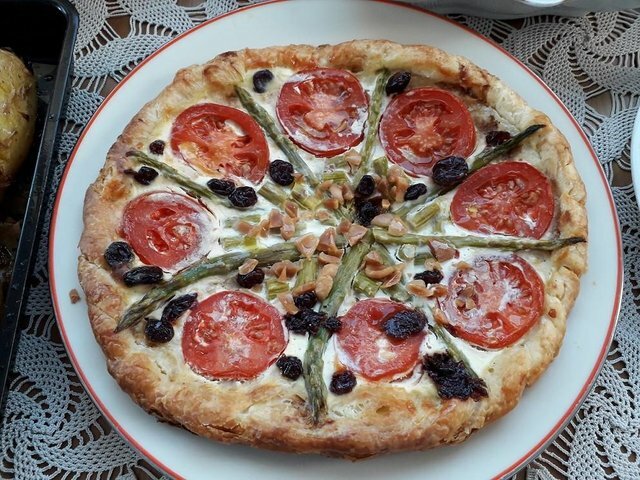 This is very easy to make... I´ve had a butter puff pastry in the fridge. I always have this as a reserve so that I do not make the dough by hand. I buy this in a supermarket and it is a good idea to store this in the fridge... a good idea for me so I can easily make anything sweet or salty dish especially if someone unexpected wants to drop-by the house. I shaped the pastry in round form and baked the crust for about 10-15 minutes under 180°C in a preheated oven.The filling goes like this... in a container, mix 1 egg, 1/2 Philadelphia Cream cheese (100 grams). Spice with salt and pepper and mix carefully to have a blended mixture. 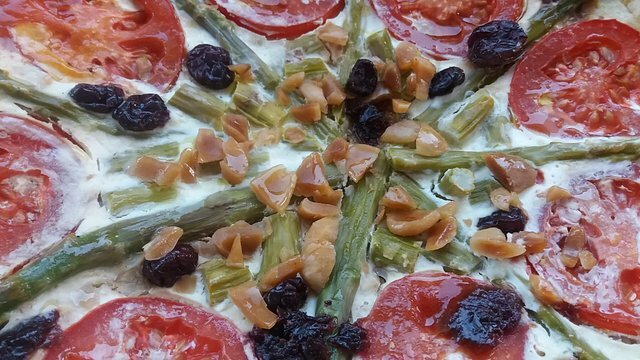 Spread this on top of the tart crust and top it with sliced tomatoes and green asparagus. I have added dried cranberries to give the taste a twist, afterwards, I sprinkle crushed almonds (optional). Cover with an aluminum foil and bake in the oven at 190°C (middle rack) for about 30 minutes. In the last 5 minutes of baking time, remove the foil to make the crust become crispy. 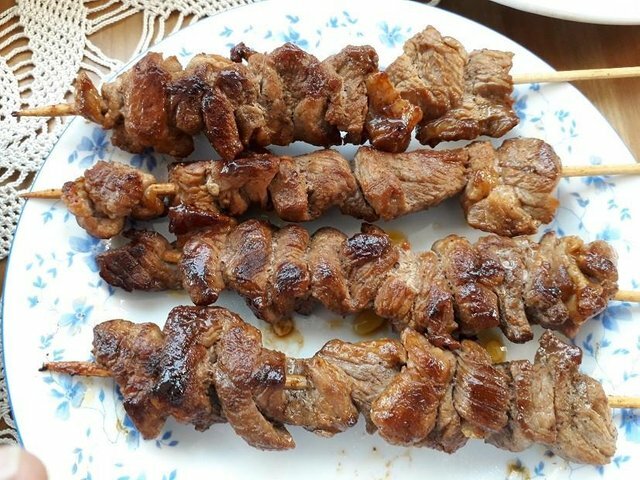 Here, I used my remaining pork chops and simply cut them into small pieces, marinated in 1 tablespoon soy sauce, a bit of salt and pepper added and fitted in bamboo sticks. They are simply pan-fried in olive oil a nd served with catsup and jogurt dip below. 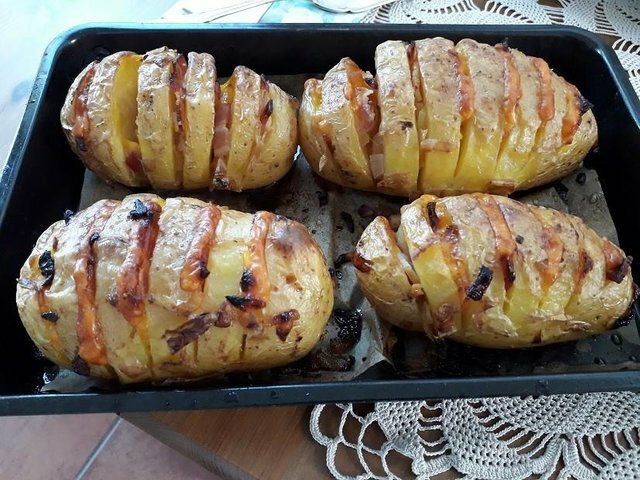 I washed and simply boiled the big potatoes with skin in a casserole with water, added 1/2 teaspoon salt (not too soft), drained the water and sliced them fan-like and inserted sauteed diced onions and a bit of bacon strips and sliced cheddar cheese.... then I baked them in the oven for 20 minutes until the cheese melted and the skin of the potatoes became crispy. 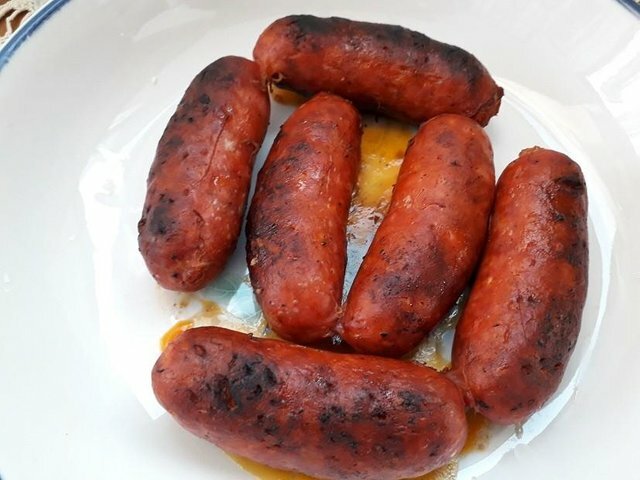 It is my favorite of all spanish sausages, they are simply delish, a bit fatty but you can not stop munching them.. 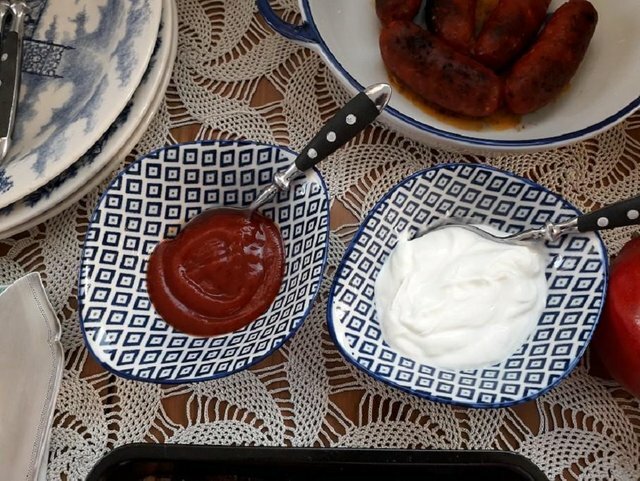 Here, I simply pricked all sides of the skin of the sausages with a fork, then boiled it in a pan with a cup of water. The fatty subtance of the sausage will come out of the holes in the skin and they will be fried from its own fat. Pronto! 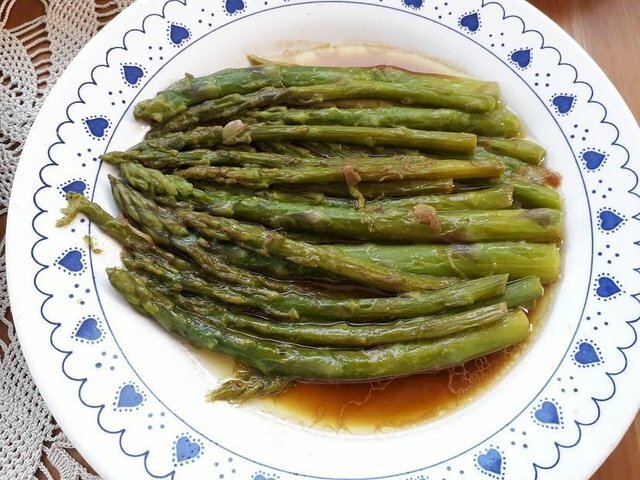 Some of these green asparagus were used to fill the Tomato Tart above... First, I boiled the asparagus in a casserole with water, added salt, then discarded the water and fry them in a pan with 2 tablespoons olive oil or 1 tablespoon butter, I sprinkled a bit with soy sauce, added 2 table spoons water, gound garlic, salt and pepper and cooked for about 5 minutes. Arranged on a platter including whatever liquid is available. 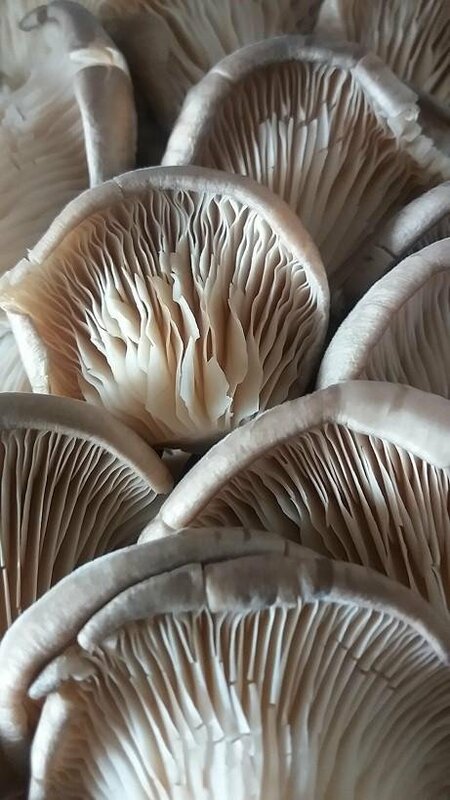 An oyster mushroom cultivated in Germany after the World War I for purposes of sustainability. 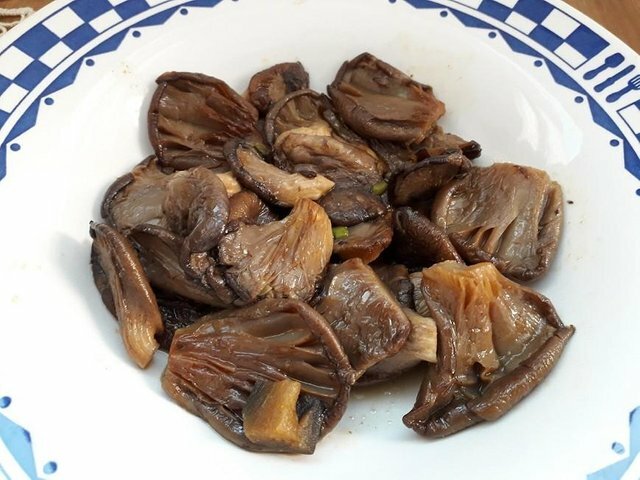 It is very edible and has been commercialized since then and a well sought-after mushrooms for they really taste good. 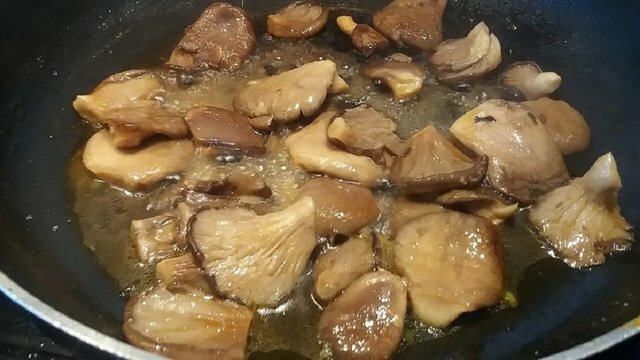 They were marinated in soy sauce and then fried in olive oil, added salt and pepper, let liquid that came out evaporated, added a dash of sugar or sugar substitute, stirred well for about 10 minutes and then transferred on a platter and served hot. 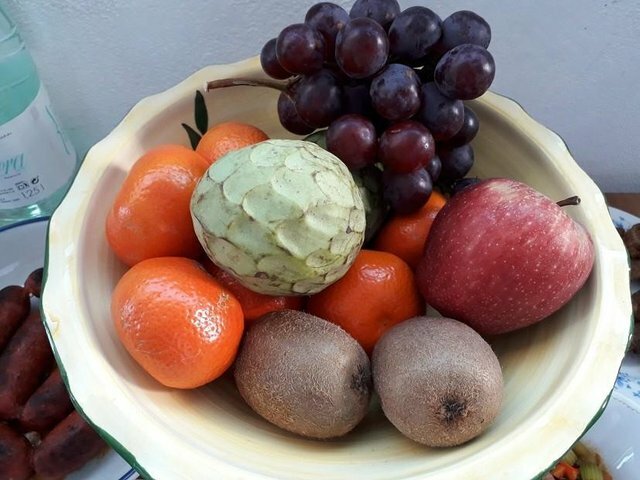 To make the feast complete, I simply added this bowl of fruits below... Everyone can take whatever they want. The view of the table from the top with all the food I cooked for hours yesterday ... eaten within a few minutes! LOL! But, everyone enjoyed, so I was just glad that everything was finished-off. Hope you enjoyed my post. Have a great weekend! Be patient with glitches! They are aware snd working hard. More updates will be coming soon! I hope you become a dedicated eSteem user! I use tipu when my voting power is low and I want to reward someone but don't want to drain my VP any lower. And just so you know, your vote % from eSteem is based on how much you use eSteem. It pays to be loyal! Oh that is cool! Glad you gave me that info.. I'll put that in mind..Thank you so much. It’s all so yummy and and well prepared! Salamat.. yan pag naiistress ako..hahaha pas-pas ang luto parang may hinahabol. LOL! 🎁 Hi @mers! You have received 0.1 STEEM tip from @melinda010100! Many thanks to @melinda010100 and to @tipu for the tip.. Your UA account score is currently 3.063 which ranks you at #10095 across all Steem accounts. In our last Algorithmic Curation Round, consisting of 177 contributions, your post is ranked at #125.